The north is a key area to hold. Getting a grip on the northern plateau gives a great defensive position from which to dominate the late game, and the financial boost from the double resource nodes can make all the difference once more expensive components are researched. The best way to take this position is to get there first, which often means rushing it with the Command Vehicle at the very start of a round. Get a barracks down as soon as possible, and you should be able to finance the development of both bases at once. Finally, don't neglect your starting base: it can prove valuable in flanking the enemy should they decide to assault your northern stronghold. It should be noted, however, that all is not lost for the team that fails to secure the north plateau. An offensive against this position may be difficult, so try and capture the rest of the map, choking the defenders and winning a war of attrition. Protect the Cliffs: As detailed in the infantry tactics below, expect many ninjas to try and attack your bases by sneaking up to the cliffs overlooking your base. They are ridiculously difficult to pry from this position, so don't let them reach it. Put turrets or surveillance near these areas so you don't have to worry about this. Stealth APC: More often then not, commanders will place their bases on top of the hills and leave the valleys in this map unattended. This allows the creative player to use them with deadly skill. A useful technique is to park an APC in one of these valleys, hidden, but very close to the enemy. The most obvious location for such activity is right below one of the three large bridges in the map, or inside the dam - it might take a long time for the enemy to figure out where these infantry keep coming from. Place surveillance structures near key choke points. A camera and radar under each of the bridges can provide valuable intelligence about the movement of enemy units, giving your team enough time to set up an effective defence. If they're well-placed, using the contours of the ground and the supporting pillars as cover, they can sometimes remain hidden for the majority of a match. Cliff Assault: It's very easy to climb up to the cliffs at the edge of the map on all three plateaus (NF Base, BE Base, North Plateau). From up here, the upward facing cliff gives you cover from any attack below while allowing you to easily rain destruction onto the enemy from above. A grenadier can easily sneak up to this area and do serious damage, and an engineer can rig fireworks with devastating affect. 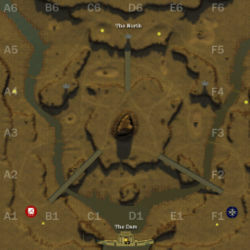 The Dam - The dam in the south is accessible for infantry by both water and land and connects the two starting locations directly. There are two buildable ramps on the east and west side that must be constructed before easy access to the top of the dam (and subsequently to the enemy base) is available. The dam also houses a resource node that generates resources at a faster rate once a refinery has been constructed on it. Mvalley was inspired by and named after Monument Valley.. The map was created by R_Yell. Was first released to the public in Beta v1.06. This page was last modified on 28 September 2007, at 09:18.